A TRADITION OF EXCELLENCE SINCE 1941: Since being founded in 1941, every tool that has been produced by Grace USA has undergone a rigorous inspection process which helps ensure genuine QUALITY and PRECISION in every tool that you can TRUST. PRECISION FOR THE PERFECT FIT - EVERY TIME: Each gun care screwdriver is custom hollow ground to fit scope screws, plug screws, guard screws, floor plate, sight screws, and many other gun screws with a tolerance of +/- .002. BLADES THAT ARE BUILT TO LAST: The square shanked blades are hardened to R/C 52-56 and constructed of USA 8650 Chromium-Vanadium steel alloy with a black oxide finish while backed by our Forever Guarantee not to twist or chip. A HANDLE YOU'LL ENJOY HOLDING: Our screwdriver handles are turned to our exact specifications using Maine hardwood, delivering a strong, non-slippery grip - even when your hands are oily. The handles are topped off with a nickel-plated steel ferrule. 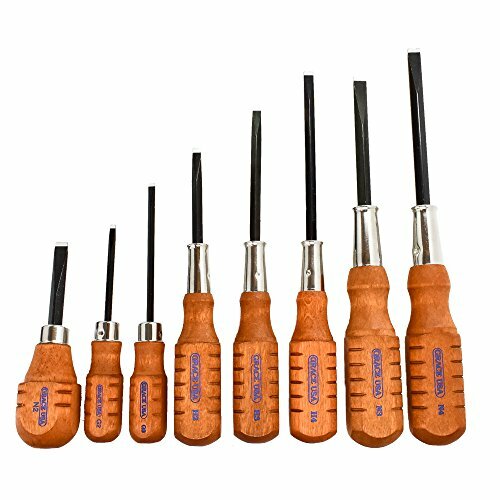 CRAFTED FOR MANY APPLICATIONS: While our screwdrivers were constructed as the ideal tool for gunsmithing, they also can be used for woodworking, industrial, military, mechanical and home care needs. PROUDLY 100% USA SOURCED & MADE: All Grace USA tools are manufactured from the best American made materials to a high standard of excellence by craftsmen who care about the products they produce. BACKED BY OUR LIFETIME GUARANTEE: Grace USA hand tools are Forever Guaranteed to be free of defects in material and workmanship. If any tool fails to give complete satisfaction it will be replaced free of charge. If you have any questions about this product by Grace USA, contact us by completing and submitting the form below. If you are looking for a specif part number, please include it with your message.